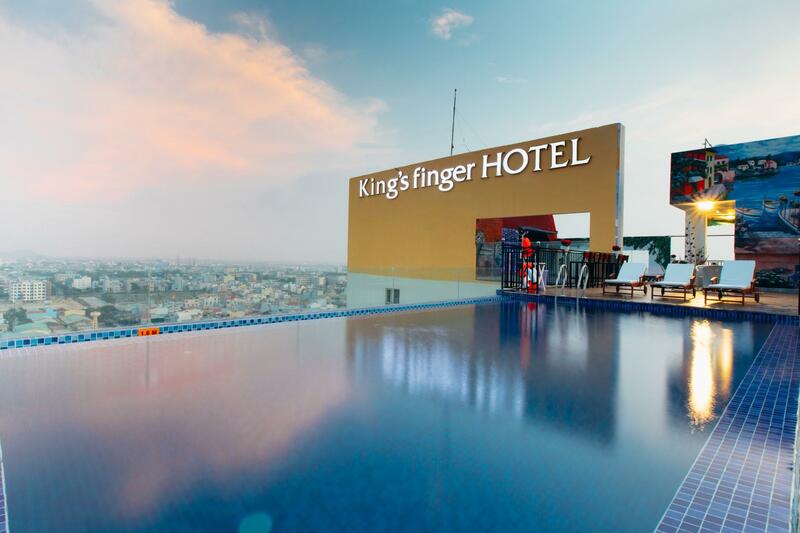 "Great view, in roof top pool, very good food for buffet brea..."
Have a question for King Finger Hotel Danang? "Clean hotel with lovely pool." "Staff are helpful and kind, good service"
Whether you're a tourist or traveling on business, King Finger Hotel Danang is a great choice for accommodation when visiting Da Nang. Only 3 km from the city center, the hotel's strategic location ensures that guests can quickly and easily reach many local points of interest. With its convenient location, the hotel offers easy access to the city's must-see destinations. The facilities and services provided by King Finger Hotel Danang ensure a pleasant stay for guests. 24-hour room service, free Wi-Fi in all rooms, postal service, taxi service, ticket service are just a few of the facilities that set King Finger Hotel Danang apart from other hotels in the city. All guest accommodations feature thoughtful amenities to ensure an unparalleled sense of comfort. The hotel's recreational facilities, which include fitness center, outdoor pool, children's playground, kids club, pool (kids) are designed for escape and relaxation. King Finger Hotel Danang is your one-stop destination for quality hotel accommodations in Da Nang. "Breakfast changed little by little every day and it was deli..."
The only problem we had was booking through agoda.. we booked a large bed, non smoking with breakfast. We got two small beds and NO breakfast. Agoda site also said free shuttle to airport after 3 night stay. We stayed 3 nights and was told by hotel this was not true.. we had to pay for breakfast and paid taxi to airport. I spent 4 days here. The location is good, many restaurants nearby. Tourist package is offered, I booked one-day tour to Bana Hills from the hotel. In conclusion, the staffs are super nice and helped me a lot. If I go to Da Nang again, I will book the hotel with no doubt. all the staffs are friendly especially Ms Elsie. Location is not far from the beach and han river/Dragon Bridge. The swimming pool and skybar at the roof top is awesome ! very nice view especially during sunset. I stayed at this hotel with my 8 relatives including 5 aunts. First of all, the room and bathroom were not so spacious, but they were really clean. There were two swimming pools on the roof and it was very windy when we swam, but fortunately the water was warm. Breakfast changed little by little every day and it was delicious and varied. And My Khe Beach is 10 minutes away from hotel on foot. The sad part is that the refrigerator in the room is for display, so it doesn't work. So I kept beer and fruit in the pub refrigerator on the roof. And there was no scale in the hotel so it was a little hard to pack our luggages. All the hotel staff were very kind, and especially there is a staff who can speak korean very well. Thank him for letting all of my aunts know what they are curious about Danang. We recommend King's Finger Hotel! This is definitely a hotel we will return to on a future trip. The members of staff were extremely helpful and we appreciated it very much we got an upgrade of our room on arrival, without ever asking for it. The location is great 5 minatues from the beach. There is a pool with a resturant on the roof and the view . is spatacular The room is big with king size bed and small balcony with great view. The breakfast is very rich with many choices. The staff were very helpful. This hotel is OK hotel that I do not want to criticize. It's because me and my family quite enjoyed swimming at the top of the hotel. Water was clean on the day and view was nice from the roof top pool. However, please be aware that photo of this hotel is JUST photos. This hotel is quite aged and I was unpleasant with this hotel although it was just few hours stay BECAUSE I found LOTS OF ANTS in the room. I was in panic worrying if I would bring ANTS to my home by staying just a few hours here. Room condition was CHEAP as the PRICE is CHEAP. Not much complaint about aged hotel but ants I saw in my small room wasn't just a few but it was hundreds on table and floor. Our second stay at Kings Finger hotel in Danang Very good hotel, friendly and helpful staff and good price. Clean rooms. Near the beach. Top restaurant and 2 swimmingpool at 16th floor. Will go back again. Free upgrade of room when we arrive. Breakfast would be a little different every morning. Staff is friendly. Great price! Nice rooftop pool and views from the hotel. A little old and run down - but not a big deal. Recommended for budget travelers! I appreciate the helps from the staffs at the hotel. The swimming pool is cool. all the staff are friendly. always smile and happy to assist. highly recommended. I could not get over the name of the hotel but it was a very good hotel. Great views, great staff, varied and tasty breakfast, and close to the beach. What's not to like? The staff was helpful in suggesting places to eat and things to do. I walked a lot around the area and the beach was a few blocks from the hotel. I wish I had spent more time in Danag but the weather was not great and I flew to Cambodia to spend time there. I will be back and I would consider this hotel for my stay. I really satisfied with the services of this hotel. All of front desk workers are kind and some workers can even speak Chinese and English! And also because it is nearby the beach, you just could walking to go there! Very recommended! This is a great hotel. The receptionnists Cherry, Annie and the personnel are very professional in their approach to customer satisfaction. I booked 3 days at this hotel because of the cleanliness, up to date furniture and facilities. For a 3* hotel, it's remarkable. The breakfast is abondant and tastefull. I am completely satisfied of my stay, I give them 10/10. The room is upgrade to deluxe room without any charges. We can view the Danang city view from my room (level 10). The walking distance to beach around 10mins. The staff is friendly and helpful to show us the way to Dragon bridge and the dinner place. They recommeded us to go "time coffee" . the coffee quite nice and best view to watch the Dragon bridge performance. The room is clean, and comfy. The swimming pool is nice, provided a nice weather in Danang. It is worth as the price is not expensive with such service and facilities. The hotel location is good with a lot of food nearby. Just the outlook of the hotel doesn't look nice.